People often ask us what they need to buy before they bring their new Labrador puppy home. Here is a round up of ten of the absolute essentials that you will need in advance of the ‘big day’. When used correctly, a puppy crate is a brilliant invention. It provides a place of safety and relaxation for puppies when they are tired. And some respite for you when you are too exhausted or busy to make sure your lovely new puppy is not destroying your antique chair legs. It makes toilet training a million times easier, and keeps your puppy safe at night whilst the family is asleep. The best puppy crate is one which is big enough for them to stand up, stretch out, turn around and lie down in. But no bigger. If you get a puppy crate which is too big, then they will be tempted to use a section of the space as a toilet. 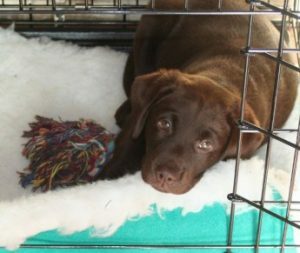 You can achieve this space by purchasing a Labrador puppy sized crate, which will fit them until they are a few months old. 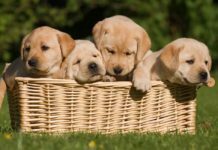 Or by buying an adult Labrador sized crate which comes with a divider, to allow you to provide the correct amount of space for your growing puppy. 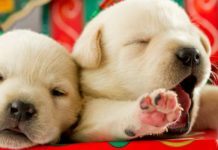 Veterinary bedding as puppy blankets is that fake fleecy fur that comes in a roll. You buy or cut a piece to fit your crate. It is not the cheapest option on the market, but in this case you do get what you pay for. It goes in the washing machine, and in the tumble dryer. And it lasts for years. For puppies, you should avoid any dog bed with a fancy liner and stuffed or padded interior. Your puppy will probably rip it open and eat the contents. No matter what it says on the label. 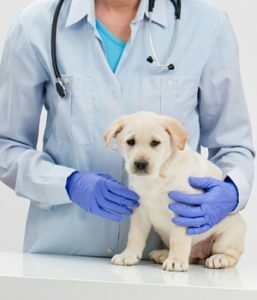 Vet bedding is a simple solution to the cleanliness and chewing issue, which also provides a soft place for your new puppy to snuggle down into when it’s time for some rest. 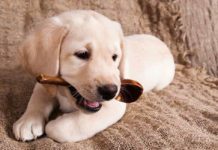 Your new Labrador pup will need at least two bowls. One for food, one for water. Stainless steel food bowls are very easy to clean and unbreakable. Most of them are dishwasher safe, and cheap to buy. So you can have a couple in the cuboard, making it easy to keep the food bowl shiny and clean between meals. The downside of stainless steel food bowls is that they can tip up, not to mention make a horrendous noise as the puppy chases them around the kitchen! To avoid these disadvantages, find a non-slip version with a steadier bottom to reduce this effect. The wider bottom and rubber base will mean it’s hard for the puppy to flip it over or push it along. The best puppy water bowls are steap sided ceramic bowls. Those designed for use by dogs and puppies. They will be heavily weighted, to reduce the likelihood of the pup tipping them over and spilling water across your kitchen. 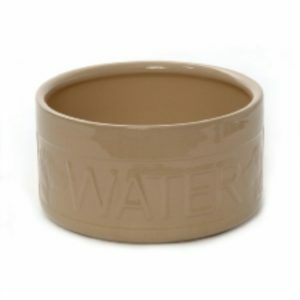 It’s important to have fresh water available to your puppy at all times, and ceramic water bowls are usually dishwasher safe and easy to rinse off as well. A good breeder will send you and the puppy home with a few days provision of the food that he is used to. It is a good idea to get an additional supply in yourself as well, just in case the quantities they provide are quite small or it’s omitted entirely for some reason. 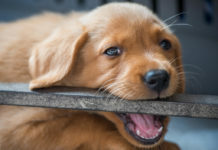 You will need to buy your own supply of puppy food in advance if you are intending to change to a different brand, although we advice you wait at least a couple of weeks before doing so to make sure your puppy is settled in. Having a supply of the new brand ready will allow you to make the changeover gradually from his old food to the new, before the old runs out. 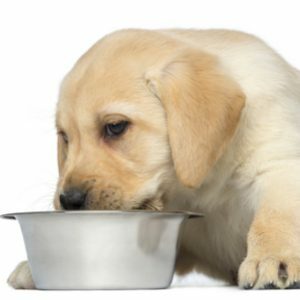 The best puppy food is one which is low in carbohydrates and high in protein. 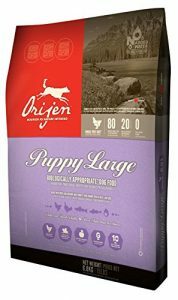 Orijen Puppy Food is currently our food of choice for growing Labrador pups. I can’t stress too strongly how important it is to have health insurance for your pet. There have been astonishing advancements in veterinary treatments available for our pets today. Most things you can be treated for, your dog can be treated for too. Open heart surgery, complex hip operations, advanced cancer treatments are all available to dog. You are usually looking at an average week’s wages for anything involving x-rays and general anaesthetics. The last thing you want to be doing when your pet is sick, is choosing between saving the dog’s life, and your daughter’s college fund. Many pedigree puppies come with a few weeks free insurance. If not, get some insurance the day before you bring your puppy home. And do read the small print before you buy, some of the cheaper policies will dump you at the end of the year if your dog gets a long term condition. I did not read the small print and this happened to me. So take care to choose a policy that keeps on renewing as long as you keep on paying. Puppy toys are fun to buy, and there are a lot of choices out there. We have a couple of real firm favourites when it comes to puppy toys. 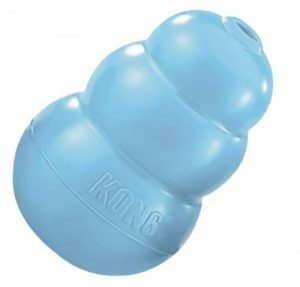 They are a great chew toy, as well as a wonderful treat dispenser which you can fill up and leave them with to keep them entertained. They bounce around and can be played with if the puppy feels inclined, or picked up and carried around. Most people’s homes will benefit from a puppy barrier or two when the pup arrives. 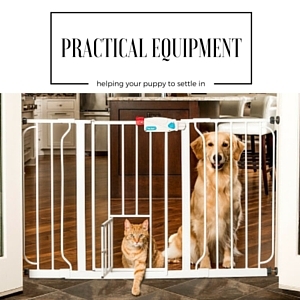 There are a few options for creating barriers, to keep your pup safe and give them some space when they need a break. But also to prevent access to the more vulnerable parts of your house when they are unsupervised. The most popular puppy barriers are actually baby gates. Baby gates make fantastic puppy barriers. They come a few different sizes, and fit into most doorway or hallway spaces. Baby gates are also convenient in terms of access because they have built in doors. The human members of the family can easily come and go, whilst keeping the puppy securely contained. 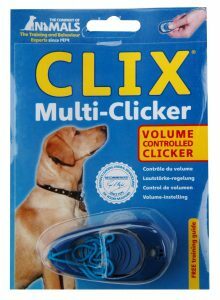 A clicker is a tool used by positive trainers to help a dog learn commands. They are referred to as ‘event markers’ as they let the dog know exactly when the desired behaviour occured. Their use is rapidly increasing in popularity. Using positive reinforcement training and working with a clicker will help you both to train your puppy, and to form a stronger bond and better relationship together as he grows. If you are thinking of giving clicker training a go, we share ten great reasons to start in this article. 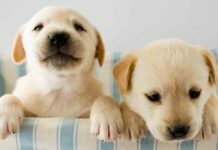 The Happy Puppy Handbook is the ultimate guide to raising and caring for your new puppy, by The Labrador Site’s own founder and editor Pippa Mattinson. Covering everything from the first days at home, through crate training, potty training, dealing with teething and much more. 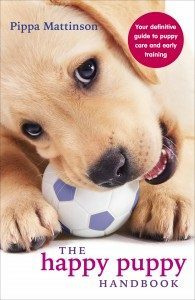 Whether you are a first time puppy owner or an experienced Labrador lover, this book will be full of practical advice and help for caring for your Labrador puppy. But don’t just take my word for it, check out the hundreds of excellent reviews of The Happy Puppy Handbook on Amazon UK to see how great this book is. Have you any tips for our readers? 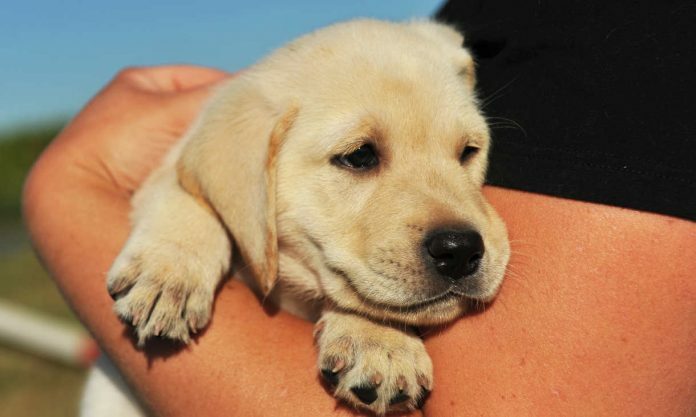 What do you wish you had bought before your Labrador puppy arrived? 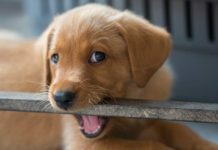 Next articleAre Labs Good Dogs – And Is A Labrador The Right Dog For You? I also have antlers for my puppy to chew on. Moose antlers are a softer chew than an elk’s antler. Like with all toys watch and make sure once it’s chewed keep an eye on how safe it is. Baby wipes help for the rainy days when housebreaking. We never got to use wee pads inside the house. We got out baby at 4 1/2 months (yellow lab) The next day we had a blizzard. We believe he didn’t know what the outside was but he loved the snow. We put a wee pad on our deck and that’s were he would go but, as the snow melted the wipes came in very handy wiping his feet at the door. The younger they are the easier it is to get in good habits! The happy puppy handbook is a great book too. I think it will also need a very good dog shampoo and a comb as they shed alot. ?